The Indian Women team is set to host England Women for the third ODI at the iconic Wankhede Stadium. Having won the first two matches, the hosts would be eyeing for a whitewash heading into the final ODI. India has played some flawless cricket in this series so far against a quality opponent. After sealing the series by 2-0, India must be eager to wrap up the series with a win. However, England is still waiting for their first victory of this tour. India once again showed their ascendancy in the ODI format after beating the current world champions England in the first two ODIs. 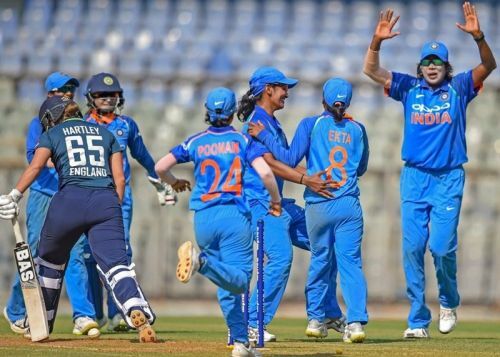 Mithali Raj has led her side tremendously well in the blue outfit. The home side has been performing well consistently in all the conditions to establish their dominance in women's cricket. Even after winning the ODI series in New Zealand, India were not the favorites coming into this home series. However, the Indian bowlers tormented the English batting lineup in both the matches to bundle them out for 136 and 161 runs. England, on the other hand, are having a terrible outing so far in this series. Having lost the series, they would hope to emerge victorious in the final ODI to save themselves from the utmost humiliation of a series whitewash. The visitors have struggled with their batting throughout this series and must resolve this issue heading into the third ODI. They need to perform well in the final match to boost their morale and end this tour on a winning note. Sophie Ecclestone has been ruled out of the final ODI due to an injury. Linsey Smith will replace her in the third ODI. Team Management would be looking to test their bench strength with the series already in their kitty. England Women ODI squad: Tammy Beaumont, Katherine Brunt, Kate Cross, Sophia Dunkley, Sophie Ecclestone, Georgia Elwiss, Alex Hartley, Amy Jones, Heather Knight (c), Laura Marsh, Nat Sciver, Anya Shrubsole, Sarah Taylor (wk), Lauren Winfield and Danni Wyatt.